Also you can contact us by phone if you wish to register in the Noni Bussiness and become distributor. 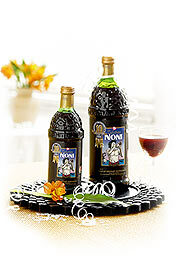 The Tahitian Noni International Company offers substantials bonuses to the distributors. For now there is NO registration fee!. Now you can register for FREE. The only condition to get it is to order a box with 4 one litre bottles of TAHITIAN NONITMJuice, each month. Their price is 527.5 Ron, equivalent to 120 points. If you skip one month and don’t order the box, you won’t get the commissions in that month. In order to get the bonus, the minimum order each month should be at least 120 points (527.5 Ron). You can write to us, our e-mail address is: admin@suc-de-noni.ro, and we’ll give you an answer as soon as possible. Write « Extra information needed » at the «Subject» section of the mail.